The post below is now almost 7 years old, and is focused primarily on jazz B3 players. The official Hammond Hall of Fame represents many different musical genres. Special congratulations to Gregg Allman and Barbara Dennerlein who have been supporters of Talking2musicians.com. To find out the answer, read his very thorough yet concise article. The history of organ jazz begins with Fats Waller, the son of a Baptist minister, who played church organ before playing piano. During the silent film era he was a theatre organist in New York. Fats also taught Count Basie how to play the organ and he probably had the first recording featuring an electric Hammond organ. Fats also played and recorded on pipe organ. In fact, in Paris he played the organ at Notre Dame and in London at the Abbey Road Studio he recorded spirituals on the Compton Theatre organ. Then came the next major figure, Wild Bill Davis, who may have had the first jazz organ trio, and was known for his “fat” chords. And then came Jimmy Smith whose magic right hand and approach to soloing changed everything. He was a great showman and soloist with superior musical instincts, and his contribution to organ jazz can hardly be overemphasized. But imagine a world where Elvis was “the singer” and everyone else who sang was an Elvis impersonator. For a long time, and to a certain extent it continues today, lots and lots of jazz organists are Elvis/Jimmy Smith impersonators. Elvis was wonderful and might have been the “king” and the Greatest to legions of fans, but a world full of Elvis impersonators is limiting to say the least. Larry Young was the first player post-JS to truly establish his own unique style and approach to the organ. He introduced a modal approach to the Hammond B3 in contrast to Jimmy Smith’s soul jazz style. He was influenced by John Coltrane and recorded as a trio with Grant Green and Elvin Jones. For a time it seemed like something really exciting might be happening, but unfortunately Larry died at the age of 38 due to untreated pneumonia. I wish there were better video clips available, but if you are interested in learning more, his 1965 release “Unity” is a good place to start. Rhoda Scott, the barefoot lady, has a few things in common with Barbara Dennerlein. She’s known for her bass pedal technique and she lives in Europe. Like Barbara Dennerlein, her mastery of the foot pedals frees her left hand for rhythmic chord playing. Rhoda, like Fats Waller, is the child of a minister and began playing the organ in church as a young child, and later studied classical piano and earned a masters degree in musical theory. Tony Monaco is another B3 player mentored and influenced by Jimmy Smith. In 2000 he and Joey DeFrancesco met, became friends, and went to the recording studio together with Joey producing him. Lonnie Smith made a name for himself with his early work with guitarist George Benson and is considered by many to be an exceptional accompanist. He is not known for remarkable solos, but his flamboyant persona and showmanship have contributed to his long and distinguished career. Wil Blades was born in Chicago in 1979 and works out of the Bay area. His mentor is Lonnie Smith and the video below is quite informative and also features Lonnie Smith. Osaka born Atsuko Hashimoto studied classical musical for several years before switching to organ. Born Eugene McDuffy in Champaign, Illinois, Jack McDuff initially played bass. In the late 50s, he switched to organ and formed a group with a young George Benson and Red Holloway on saxophone. Brian Auger is a rock, R&B, jazz keyboardist from England known for his B3 playing. In the late ’70’s his Oblivion Express recorded two breakout LPs, “Closer To It” and “Straight Ahead” which appealed to jazz and rock audiences. Unfortunately I couldn’t find video clips of some excellent players like: Shirley Scott, Groove Holmes, Bill Doggett and several others, but I did link to some audio of them. PS If you are a B3 fan be sure to check out the Doodlin Lounge. ← New DVD series featuring Coltrane, Brubeck,, Wes Montgomery a.m.m. Save 25% on tickets! Use code “JAZZ 25” to purchase now! Organist Joey DeFrancesco single-handedly brought the Hammond B3 organ back into the public eye. The winner of five consecutive Down Beat Critics Poll awards relights the fire of the classic organ and tenor combos as he is joined for this special evening by tenor saxophonists David “Fathead” Newman, Vincent Herring and John Nugent. i love you guys for making sure hammond is not forgotten.melvin mel davis. Mel Davis is one inspiring person, one of his fingers was cut off in an accident (and reattached in emergency surgery.) It took many operations and years of rehabilitation before he could restart his musical career. His loss of strength compelled him to switch to organ from piano. His determination paid off. I’ve got two of his CD’s and give them both a big Jazzamatazz recommendation. I especially like his debut CD “Revealed” which was produced by the gifted guitarist Ronny Jordan. And the title song of his next CD “It’s About Time!” is alone worth the price of admission. Mel has found a sweet spot between jazz, R&B, & funk that is really enjoyable to listen to. Check him out! thanks looking for co producer on latest venture smooth hip hop un like any other organ cd. Not true! HAMMOND SUZUKI, USA And Mr. Suzuki’s, Million Dollar Check Book brought back the Hammond B3 Organ and saved the Hammond Organ Company from going out of business forever! Lets also give credit to the management and the many awesome people who work at the factory every day. Moreover, how about all the great Hammond Artist that were still performing, recording and around playing the Hammond B3, older cats, new guys and more. I guess they had nothing to do with keeping the B3 alive. Alan…Jimmy Smith the King Of The B3, The Mighty Burner – Charles Earland, The great Jimmy McGriff and more were still alive playing their asses off when Joey said he was saving the B3. This is nothing but Hype from one person and for an organist who was “let go” as an artist by Hammond Suzuki, USA! There were hundreds of great Hammond B3 organist playing when Hammond Suzuki, USA turned their company around. The Hammond B3 organ has always been loved by thousand of great musicians and fans all over the world, not to mention thousand of churches who play them ever week. I will say that Joey DeFrancesco is one of many great organist, but this statement by him is not true and the real cat’s all know it. Organ: Joey DeFrancesco. I like old-time soul jazz as much as anyone, but I don’t find much to choose from any more in the organ players. Just to pick one example, I’ve heard things recently by Mike LeDonne (#6) I’ve loved and hated, and I’m not sure he can tell the difference. I don’t have much of a sense of DeFrancesco, but he’s certainly better than Larry Goldings (#2) or Dr. Lonnie Smith (#3). RS: Sam Yahel; Gary Versace (tie). I prefer Versace to Yahel, but I like Vince Seneri (off the list) better than either. I’m late again this year: was slow getting to it, and slow getting it done. The fact that I’m posting it as early as I am is the result of cutting back on some of my ambitions. I did manage to round up all the old pieces and collect them here. I meant to do some more supporting research, especially for their Hall of Fame question. Also wanted to put together some files to remind me who I like on what instrument, but didn’t get that done. As such, my notes are as haphazard and impressionistic as ever. Vince Seneri has been pleasing audiences for over twenty years. He is one of the most talented and dynamic ‘burners’ of the Hammond B3 organ on music scene today. Endorsed by Hammond Suzuki Organ Company, USA and on the Senful Record Label, he is in demand for nightclubs, shows, theaters, festivals, and concerts throughout. Vince Seneri provides a first class performance at all his shows. He is a charming, confident person with a friendly welcoming manner. The integrity for the music and aim to please his audience is paramount. Appreciated as both a musician and performer, Seneri has a dual persona of expert improviser and vibrant entertainer on the Hammond B3 organ. He places his keenly discerning art and virtuosity in the service of a rousing good time . Raised in Hackettstown, NJ 50 miles west of New York City, Vince began his musical career on the accordion at the age of six. His father, Peter Settineri, was an accordionist who played professionally with his own band during that time and introduced the instrument to his son. Subsequently, his father bought a Hammond M-3 organ and introduced that instrument to his son as well. Vince studied the accordion first and later devoted himself to the Hammond organ and piano. During his teens, it was the great Jimmy Smith who musically influenced Seneri more than any other jazz organist. He also admired and was greatly influenced by other organists like Jimmy McGriff, Dr. Lonnie Smith, Richard Groove Holmes, The Mighty Burner Charles Earland, Larry Young, Captain Jack McDuff, Ronnie Foster, Wild Bill Davis, Don Paterson. His piano influences were Oscar Peterson, Wynton Kelly, McCoy Tyner, Chick Corea, Herbie Hancock among others. Barry Harris and Dr. James Williams were also great influences who he was fortunate to study with. Vince is also a graduate of Rutgers University located in Newark, New Jersey where he received his BA degree in marketing. Some of the musicians that have performed and recorded with Vince include: Randy Brecker, Dave Valentin, Houston Person, David “Fathead” Newman, Paul Bollenback, Buddy Williams and many more. Vince has several CD recordings, most recently Street Talk, which received rave reviews and was considered the best B3 record for 2005. Rick Holland, JR247: Welcome to JR247. Great to have and thanks again for your time. You came from a musical family. Can you tell us the impact this had on your love for music? Vince Seneri: Yes I can. Music has always been an important part of my family life. I began my musical education at the age of six. My father, Peter Settineri, played the accordion/SanoVox and exposed me to the instrument. I began taking lessons on the accordion and shortly after began playing the Hammond M-3 organ that my father purchased. My parents were both very encouraging. Music had always been a very important part of my family life especially when I was growing up. I had a great uncle from Sicily, Italy who was an exceptional mandolin player. His name was Louis Loria. He was a very special person who loved music with all of his heart. He always encouraged me when I was a child developing my skills as a musician. I am proud to say that he performed everywhere for thousands of people and was invited to perform at the White House for Harry Truman back in the ’40’s with his mandolin ensemble. I also have another uncle, Pat Cantarella, who is an excellent accordion player. He also plays the kordovox. He, too, was very encouraging to me when I was a kid. Both he and my father still play their accordions today. JR247: Did you formally study piano? Or was your focus entirely on organ? VS: I studied piano formally as well as the organ. I play piano every day and piano first before I sit behind the organ. JR247: Can you speak to some of the people who have influenced you? You obviously have a great love for the music of Jimmy Smith. I noticed you had a close relationship with the late James Williams? http://www.taichitimes.com/jazzradio247/jr247	Powered by Joomla! Generated: 10 January, 2013, 08:58in the early years of my life. I had a love for Jimmy Smith’s sound since I was ten years old. He has influenced me greatly and has been a big part of my life musically. I couldn’t help but to learn from Jimmy Smith. He was the best! If you want to know why Jimmy Smith was the best B3 player ever to live, listen to all of his recordings and you’ll understand the legacy and history he has giving the world. He truly is the “King” of the Hammond B3 organ! I have listened to every B3 players’ music either recorded or live and have a great deal of respect for all the masters of the B3. But the truth is, they all learned how to play from Jimmy Smith. Jimmy had always treated me with kindness and respect when I was coming up as a young musician. I was blessed to see him at his best when I just was a teenager. He was an exceptional performer. Dr. James Williams was brilliant both as a musician and person. I studied jazz piano with him privately in NYC. He taught me things that only come with life experiences that a professional like Dr. James Williams has acquired. He was there with Art Blakely and many other greats living and performing during that period. He was a great teacher and a magnificent musician. He had a good heart and I was very blessed to have him as a mentor, friend and teacher. What more can any aspiring musician ask for? Lastly, George Benson was a great inspiration to me as well. I have known George for over 20 years and it was he who encouraged me to sharpen my craft and start recording. In fact, George Benson started recording me by engineering my first demo recording at his home studio in the early 90‘s, from there, it was straight ahead. R247: Vince, can you tell the readers and listeners some of the people you perform with on a regular basis? And possibly some of the performances you’d like us to know about? I love the cuts with Houston Pearson by the way, very soulful indeed. VS: 1. I have performed and recorded with Dave Valentin, David “Fathead” Newman, Houston Person, Randy Brecker, Paul Bollenback, George Wadenius, Drummer Buddy Williams and many more artist. I have also performed as a guess with George Benson at Birdland, NY for the Jack Mc Duff Tribute show. 2. I must say that my performance in Huntsville, AL at the Jazz-N-June Festival was very special to me since I was the headliner and the first B3 performer to ever play there. The fans were outstanding and people flew in from all parts of the country to see this major event. The place was sold out! Hammond Suzuki, USA even shipped a brand new Hammond organ and Leslie for me to perform with at this extravaganza. It was the biggest jazz event in Alabama and I was honored to be there. I was humbly touched by the reception that the people of Alabama gave me and my band; southern hospitality at it’s best! After that show, my band and I received keys to the city and were made Honorary Citizens of Huntsville, AL. I was so honored! The band was exceptional, too. I was very proud to have Dave Valentin, Paul Bollenback, Gary Fritz, and Paul Wells in my band. 3. Another recent event as a headliner that I performed at this year on August 25, 26, 27, 2006-at Zanzibar Blue International Jazz Club, in Philadelphia, PA. There were six sold out shows and a cast of musicians that are second to none! The band consisted of Randy Brecker as my special guest, as well as Dave Valentin, Paul Bollenback and percussionist Gary Fritz and drummer Paul Wells. It was my first time playing with Randy Brecker and it could not have gone any better, what a class act. The music that we played was “burning” and we all got along great. There were no attitudes – just great musicians giving their best. After three nights and six shows, Randy Brecker and I became good friends and decided to record together on my next record in 2007. Working with these marvelous musicians at a exceptional venue like Zanzibar Blue and with Randy Brecker was an experience I will never forget. JR247: Vince, what are some the challenges of being a B-3 artist? VS: Moving the instrument to the gig! LOL! It’s a physical instrument to play. 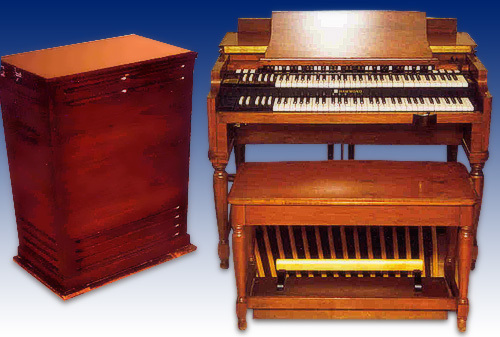 You have to be both musically and physically in shape to play a Hammond B3 organ effectively. It’s not a piano, or synthesizer, it’s and organ. You have to know the sound of the instrument, how to articulate the drawbars and Leslie speeds when playing music. What most people don’t know about playing a Hammond B3 organ is knowing how to be a great bass player. The bass line and groove are very important! It’s an instrument that requires 5 limbs! Two keyboards, a volume pedal and bass pedals to boot; all going through a Leslie speaker. Sure a lot of guys have technique, but what they lack is soul! What really separates the men from the boys when playing a B3 organ is knowing the music well and having the God given soul behind that music. You either have or you don’t! The groove, feel, your techniques and style all have to work in sync. Put that all together with soul and dedication and what you have is greatness. That’s the way a B3 organ should be played. JR247: Can you speak to some of the challenges in keeping this sound alive and moving forward? How do you see the future of B-3 musicians? VS: Yes. 1. Let’s start with Hammond Suzuki, USA! They are manufacturing the best new Hammond organs ever built in the history of their company. The management is extremely dedicated to not only preserving the sound of the Hammond organ but committed to bringing the best quality Hammond organs ever made to the world and music industry. The models include the new Hammond B3 organ, Portable B3 organ, The B3 Ultimo, Hammond XK System Traditional which is a modular B3, or the single XK3 organ a one manual B3 and much more. They also have a wide variety of phenomenal Leslie speakers to match. The Hammond sound is more popular today than ever! People world wide crave the sound and the music behind it. 2. Educational institutions have got to expose the kids of today to the arts first and to the great american classic sound and instrument of the Hammond organ. Less sports and more music in the schools. 3. As long as there are dedicated players of the instrument that are passionate about the integrity of the music and the B3 sound, the future will continue to be bright for the B3 musicians on the concert level. Unfortunately, a lot a venues have disappeared on a club level scene where a lot of cats make their living performing. A lot of that has to do with life style changes and people not going out as much do to home entertainment competition. Lets face it, the bar scene is considered not cool in today’s society and people have changed their life their styles with the new times. Point in case, there are fewer venues to perform at and many more new cats on the scene who need to express themselves on their respected instruments. JR247: Changing the subject slightly, how do you see the State of Jazz currently? Do you see it as a healthy art-form? VS: There is no limit to what an artist can do with jazz music, it’s the best music in the world. It is still one art form that takes talent to play! What I can’t stand are record labels and promoters who refuse to give a new generation of players a chance to record or perform at concert venues world wide and let them grow. Nothing against the older cats, but the younger players who are just as dedicated and as good need to have a chance to perform. I constantly hear from the younger cats that labels and promoters seem to discriminate against them or hire the same few guys for the hi end gigs, etc. This has to change, it’s ignorance! A new generation of players are on the rise and deserve to be hired and played on the radio. How many times can you hear Miles Davis, “Kind of Blue”! Please enough already! JR247: What do you believe needs to happen in the educational field to enhance the awareness of the music? Do you feel the future lies in the hands of educators? Or, do you feel the performers need to have a more active role in spreading the Gospel of Jazz? If so, what are some things they need to do? VS: More money for the arts, less in sports! Simple! The performers should continue to spread the gospel, I think most of them do their best through recordings and performances. We also need the music manufactures to make affordable instruments and teach people on the retail end how to sell their instruments more effectively, ergo, pump up the educational side of their products as well as the the music stores and school systems. Lastly, it starts at home, and a burning desire to want it. Parent must push and encourage their kids at a young age. And for all the people who are looking for someone to make it happen for them, I always say the best helping hand you can find is the one at the end of you arm. JR247: What are your goals for the next year? VS: New record and many more concerts around the world. Get ready cause you ain’t seen nothing yet! JR247: Who are some of the players in today’s scene that inspire your music? VS: I can’t name a specific one because there are a number of current talented artist that have a lot to offer. JR247: Vince, please tell the listeners here about some of your projects. We’ve played Street Talk a lot at JR247. What is was like working with some of these musicians, and outcomes you’d like us to know about. You’ve had great personnel on each of these recordings to say the least. VS: All the cats on my record are very professional and the best at their prospect instrument. They all bring something unique to the table and have great passion for the music and for the CDs I recorded. I was blessed with the variety of greats and more. All these cats are a class act in their own special way. JR247: I know your very fond of the new organs made by Hammond. Can you speak to your relationship with Hammond. Do you have some role or roles in the outcome of these new organs? How do you see the future in making of these instruments? JR247: Vince I love your presentation on Street Talk. I’m big on the idea of playing music to an audience. What I mean, is Jazz needs to have that unique balance between artistry and listenable quality. Do you have some opinion on this? VS: I play what I feel and what is true to me as an artist. I can only be Vince and that’s who and what I am, Vince Seneri. Be yourself is my rule. JR247: Vince what are some other things in your life that complete you as fully formed musician, human-being? Interests, hobbies. Etc.? VS: Playing music to the highest level and with the best cats available. As a person, God, Family, love ones and friends. I have a passion for Corvettes. Vince I want to thank-you for taking the time to spend with us at JR247. We wish continued success to you!! Thank-you. Hall of Fame � Jazzamatazz”. I am going to you should be coming to ur page soon enough. Thanks Rosa, the B3 is something special indeed. Absolutely, you’re right. Walter Wanderley was a great talent with a very distinctive musical voice. Absolutely agree. Walter Wanderley is still not taken seriously by the critical establishment, but in his time was probably the biggest selling B3 star and continues to sell. His unique style doesn’t sound like he’s trying hard enough for some people, but the technique is buried – doesn’t mean it isn’t there. Just like someone called Basie, eh? ?